I have been eying these guys and this solution for quite some time now. 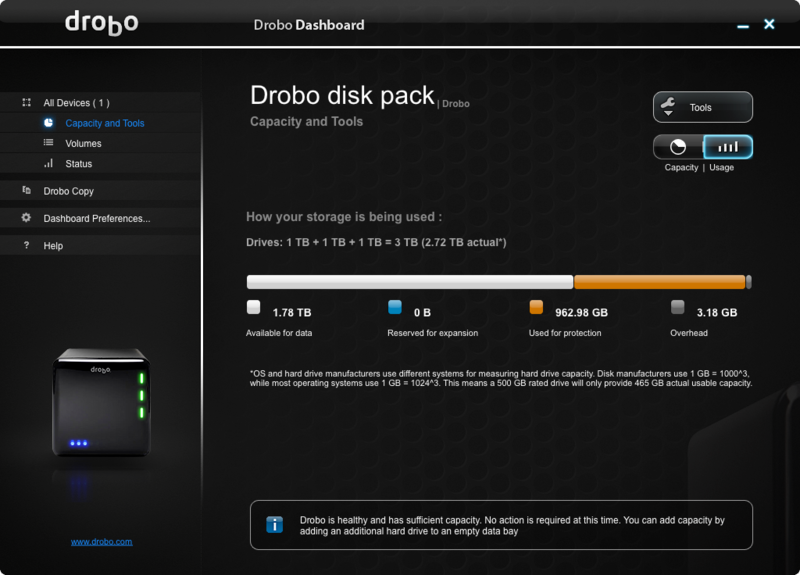 I was first introduced to Drobo when I had to do some remote work for our art department in Canada. 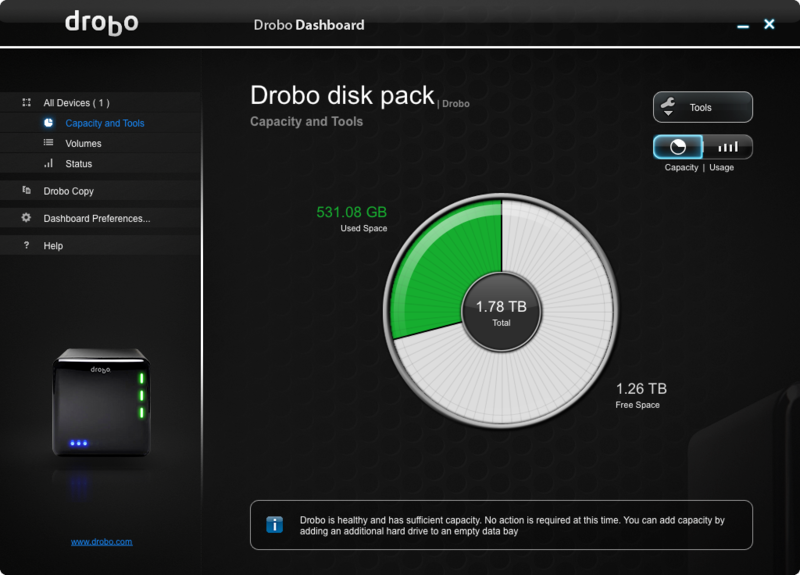 As they work independently off their own server they chose to use a Drobo as their storage solution. I was asked to assist with some remote patch upgrades and found this little gem mounted to their file server. As the curious tech I am I did a little research on the device, but didn’t really think much more about it at the time. 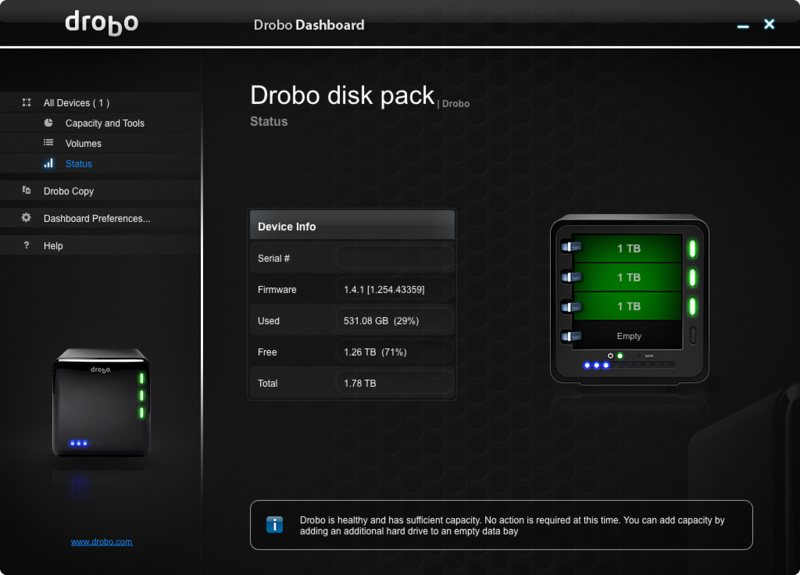 Over the course of the last couple of years the Drobo name has seemed to be popping up more and more frequently. A few photographers I know have added them to their workflow and many of the podcasts I listen to either have guests who support them or are sponsored by Drobo. I can’t remember the specifics of what was important to me at the time I was listening to this specific podcast, but the passion I sensed from the testimonials I was hearing made me go and take another look at the Drobo technology. What isn’t to love about this idea. As an IT professional I support many RAID arrays. I love them from a redundancy standpoint, but when the time for expansion and migration comes they can be less than ideal. I have in the past considered adding a raid to my house, though never really wanted to bring that kind of solution home with me. So this device called Drobo is going to provide me with beyond raid? A technology that allows me to add drives at what I can either afford or choose and grow them when I want? It all sounds to good to be true and with a quick Google search you find tons and I mean tons of bad reviews on this little device. I have to quite often remind myself that most of the time you only hear from those who have problems and 90% of people are completely satisfied and silent. But still at a starting point of $400 this isn’t a decision most people will make without doing a bit more research or trying to get some first hand testimonial on. And it was in doing this research that I got lucky. A fellow photographer Jacob Lucas whom I follow, who just so happens to live in my beloved home of Seattle, had just written a blog on his workflow and as a part of his post, in conjunction with Drobo, had a contest to win one. I’m not sure why the Gods decided to bless me as the winner, but I’m sure glad they did. Within a week of being notified as the winner I received this marvel of a device and had to remind myself to be patient and document the occasion with photos and this review for you my wonderful readers. The packaging was no frill, in fact the device you see above was boxed in what was used to ship. As a consumer this doesn’t bother me at all. I much prefer to not spend money on unnecessary packaging. Although I was hoping for a box shot of the product. Drobo provides you with exactly what you need to get up and running, less the hard drives depending on the model you choose. Included in the accessory box was the power supply, 1 firewire 800 cable, 1 USB cable, the manual and the installation CD. To get up and running I added two Hitatchi 1TB drives to the drobo and let it do it’s RAID magic behind the scenes. So while the Drobo was working away and creating my array I installed the software on my computer and ran the updater to obtain the newest version (2.0.3.4 at the time of this writing) of the Drobo Dashboard. After all my software updates were complete I plugged in the Drobo to my computer with the Firewire 800 cable to begin migrating my data. This step really caught my attention. While plugging in the firewire cable I noticed that a little extra attention had been given to the quality here. Drobo could have included any old cable or not included one at all, but instead it appears that they put some thought into it and decided to go with quality. the cable feels sturdy and has a nice metal end on it, unlike the plastic ones that are common with other devices. Knowing how long data migrations can take I set this up to run while I went on to other things. Unfortunately upon my return I was received with a message that one of the files could not be read or written. After checking all the libraries I found that none of them had successfully transferred. So I began transferring my libraries one at a time to isolate the troublesome one and see if it is resolvable. In hind sight, having to migrate the data in a more supervised scenario turned out to be beneficial, although I didn’t feel that way at the time. My thoughts quickly turned to “This has to be the slowest device on the planet, there is no way I am going to be able to work off of it.” It was taking hours for minuscule amounts of data to be copied from one external drive to the Drobo. I thought it may have just been the drive so I tested with a few others which all displayed the same results. After spending a couple minutes on the support page the answer to my problem was found and a firmware upgrade resolved the issue. Though the method in which you manually update your Drobo isn’t documented where I would expect it to be and caused me another 10 minutes of site searching. As with all devices there are going to be concerns and customer wants. Here are a few of mine. On more than a few occasions the Drobo has become unresponsive. I have had Aperture stop responding while performing tasks that have required me to have to shut down the computer and remove the power from the Drobo to recover. Upgradability – I see firewire 800 coming to an end of life in the next few years. It would be nice to know what migration implementations will be available when new hardware is released. Hopefully I will be able to swap the drives from one drobo device to another and simply plug that device into my computer. Even better would be to have the connectivity card in future versions be in a removable slot that could be exchanged when technology upgrades. Though I am sure this would involve a whole new world of engineering. After making sure that all my backups from the drobo were complete I slid a third 1TB drive into the Drobo. The addition of this drive seemed to happen instantly. I was expecting to hear that popcorn sounding drive data noise for at least the next few hours while it performed the replication magic needed to insure my data. But to my surprise it was done a moment after the drive was nested. Here are a few screen shots of the user interface after adding the third drive. In conclusion I would have to say that I have been very pleased with the overall experience I have had thus far with my new Drobo. As of this writing I would highly recommend this solution to anyone who cherishes their data and is looking for a hassle free way of making sure it is protected. If your using a Mac I would recommend the usage of a program like caffeine when performing time consuming tasks to make sure your system doesn’t sleep. My guess is this is what was causing the Drobo to become unresponsive, but I would have to test further to be sure. One thing to note is this is not a quiet solution. And this could be a result of the types of drives I used, but when I am doing read/writes of large sums of data the Drobo is a bit loud.